Surveillance footage shows an SUV driven by Aaron Hernandez circling the block near a Boston nightclub, waiting for a group of men to get in their own vehicle, before pulling up alongside it and spraying it with gunfire, according to a search warrant released yesterday. It's the most solid evidence yet connecting Hernandez to the 2012 double-murder, for which no one has yet been charged. The warrant, relayed in today's Hartford Courant, provides more information on the the drive-by killings of Daniel Abreu and Safiro Furtado on July 16, 2012. 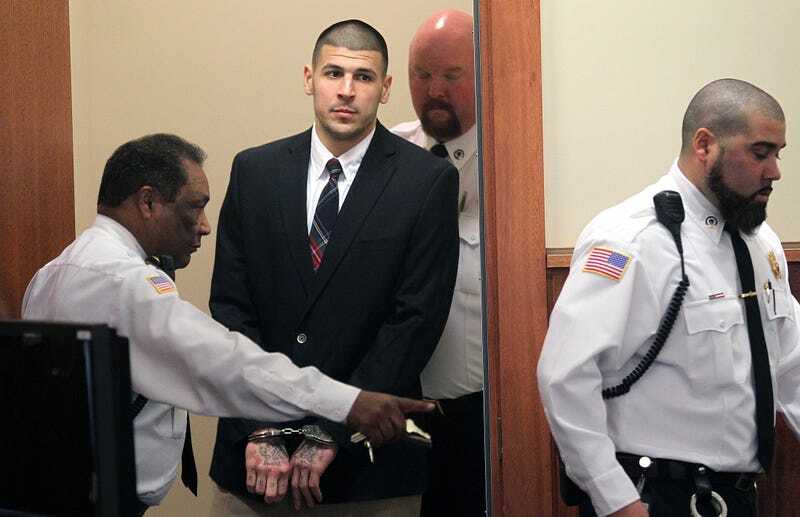 Hernandez has emerged as the focus of the investigation. Security cameras at Cure nightclub show Hernandez and associate Alexander Bradley, who is currently suing Hernandez for allegedly shooting him, entering the club immediately after Abreu and Furtado. There have been media reports that the two groups had some sort of altercation, but that isn't borne out by the information in this search warrant—Hernandez had two drinks and left after 10 minutes. The two got in a Toyota 4Runner, Hernandez driving and Bradley sitting shotgun. That SUV was later recovered at the house of Hernandez's uncle. An hour later (it's not clear where the vehicle was during this gap) cameras show the 4Runner circling the block around Cure at a slow speed, until the group including Abreu and Furtado left in their own car. The 4Runner pulled up alongside the car at a stop light, and "five or six shots" were fired, striking and killing the men. The warrant doesn't indicate who in the SUV is suspected of pulling the trigger, but a man who was in the back seat of the targeted car has reportedly told police Hernandez fired the shots. The murder weapon, a .38 caliber revolver, was later found in the trunk of a car belonging to a Bristol woman who told police her friends, "football players," had left it there. The search warrant also reveals what first brought Hernandez to Boston police's attention. June 22, 2013, five days after the murder of Odin Lloyd, a security guard at another nightclub called police with a tip. He said Lloyd's shooting and the 2012 drive-by killings were related, and that he had learned this because a patron of his nightclub—where Hernandez and Lloyd had an argument two days before Lloyd's death—"accidentally spilled the beans in front of me."